← CJSM Welcomes in 2016! I don’t think the NFL will be able to survive if the sorts of hits occurring in this game, regardless of their ‘legality,’ continue. I think the public will pull away from its continued (and currently growing) support of the professional game, and I think the pipeline will run dry: I think that ever shrinking numbers of youngsters will pursue the sport of football, and they will either migrate to other sports (not such a bad trend) or to the perceived ‘safety’ of iPads and video games (a really bad trend given childhood obesity rates in the U.S.). Ryan Shazier on Giovanni Bernard was deemed a legal hit (i.e. no flag thrown), presumably because the receiver carrying the ball was not ‘defenseless.’ Vontaze Burfict on Antonio Brown was deemed illegal (and penalized) because it was clearly delivered to a defenseless player, and appears on viewing to be downright dirty. Both hits were extremely dangerous, to both players involved. 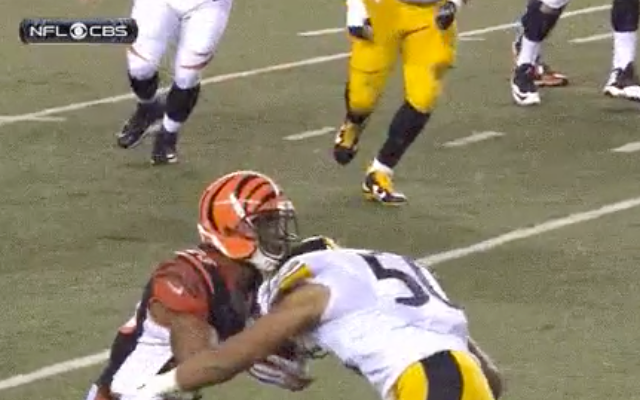 Looking at the Shazier on Bernard hit, for example (see photo), not only is the receiver at risk, but the defenseman is in a perfect position for a catastrophic neck injury. Where is ‘heads up’ tackling???? Concussions and more concussions. There seems to be no end to the discussion, and in support of this we continue to publish concussion-based research at a brisk pace. In our current issue alone we have new research on the effects of American concussion legislation on reporting of sport-related concussions; a study involving vestibular rehabilitation of adolescents suffering from concussion; and research I was involved in on persistent orthostatic intolerance post-concussion using tilt-table testing. And if that’s not enough, we even have one of our Associate Editors, Dr. Tom Trojian weighing in on the fears of youth football and its potential association with the development of CTE in this Philadelphia Inquirer piece. As for myself, I’ll be giving a Grand Rounds lecture on this in a few weeks, and will post the video to this blog, in addition to the post I have already composed regarding my concerns that there has been a lot more hype than science to date in the conclusions being drawn regarding the risk of CTE to youth football players. Did you see the movie? Have you watched the NFL playoff games? Let us know. Here’s to hoping we’ll see more good football and less ugly (non)tackling in the NFL playoff games that remain this season. Nice post. 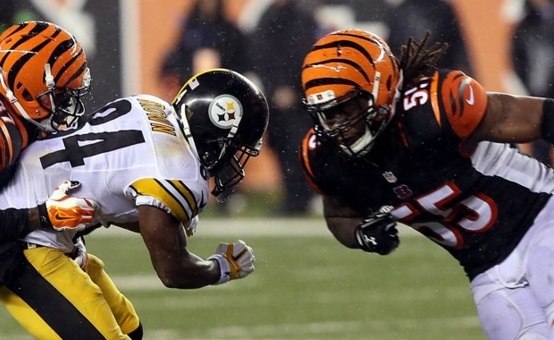 I saw that ugly Steelers-Bengals game..it was hard to watch the hit on Antonio Brown. I read something about the concept of helmet-less tackling drills may play a role in reduction of concussions. http://www.sciencedaily.com/releases/2015/12/151223141443.htm I thought that was interesting and I wonder if Rugby has overall less concussions? March (timed with Rugby 7’s tour visit to Las Vegas) and will post the updated infor on twitter when I get that — @cjsmonline. Cheers!